VIENNA—Iranian officials said Monday that the Islamic Republic’s Central Bank has successfully repatriated 13 tons of gold as part of a package of sanctions relief provided to Iran by U.S. and Western powers. The gold was transferred to Iran by the government of South Africa, which had been holding onto the assets due to harsh sanctions meant to pressure Tehran to rein in its rogue nuclear program. The gold appears to have been released as part of a sanctions relief package that will have awarded Iran nearly $12 billion in unfrozen cash assets by the time negotiations wrap up next week. 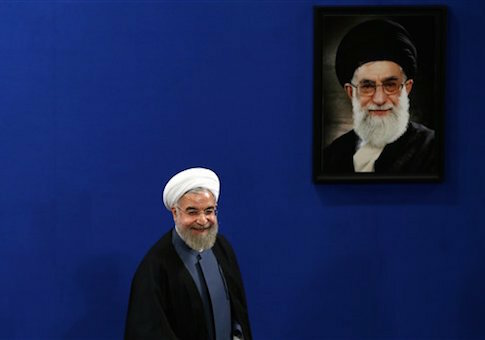 Iran received $4.2 billion in unfrozen assets under the 2013 interim agreement with the United States and was then given another $2.8 billion by the Obama administration last year in a bid to keep Tehran committed to the talks. The State Department calculates that Iran will have received a total of $11.9 billion in cash assets. The governor of Iran’s Central Bank announced to the country’s state-controlled media that the South Africans have finally returned the 13 tons of gold. "A sum of 13 tons of gold that had been purchased before and was deposited in South Africa in the past two years and could not be transferred to Iran due to the sanctions… was delivered to the Central Bank of Iran's treasury last night," Central Bank Governor Valiollah Seif was quoted as saying by the Fars News Agency. Seif said Iranian officials had been working for some time to secure the gold’s release, but that the country was prevented from doing so as a result of the "illogical problems that were created under the pretext of the sanctions." "The removal of Iran's sanctions and gaining access to the country's financial and gold resources abroad is one of the main objectives of Iran's negotiating team in the ongoing nuclear talks," Fars reported. Meanwhile, Iran’s ambassador to Paris this weekend stressed that his country’s main objective in the talks is to end international sanctions, which had nearly crippled Iran’s economy at their peak. "Fortunately, the West has come to realize that the weapon of sanctions has not been effective and has been forced to change its approach and recognize Iran's legitimate rights," the official was quoted as saying on Tuesday. Iran’s GDP has grown 3 percent in the last year, prompting experts to warn that ongoing sanctions still imposed on Tehran are not working. "The report represents the latest sign of improvement in Iran’s economy in part as a result of the partial sanctions relief it received after signing an interim nuclear agreement in November 2013," according to Iranian expert Saeed Ghasseminejad, an associate fellow at the Foundation for Defense of Democracies (FDD). This rate of growth has enabled Iran to grow its oil sector and halve its rate of inflation. "The erosion of the sanctions regime raise serious questions over Western countries’ leverage over Tehran in nuclear negotiations, and whether reaching an acceptable nuclear deal is even possible," Ghasseminejad said. This entry was posted in National Security and tagged Iran, Nuclear Weapons, Sanctions. Bookmark the permalink.